When Willem Leister Einthoven, inventor of the electrocardiogram (EKG), sent an EKG over telephone lines back in 1906, it was the first example of modern telecardiology. More than a century later, Vanderbilt Heart and Vascular Institute cardiologist Allen Naftilan, M.D., Ph.D., puts a stethoscope to his ears and listens to the heartbeat of a patient more than 90 miles away. Telemedicine makes it possible for him to identify a heart’s galloping rhythm or a whooshing murmur even though he’s in Nashville and the patient is in Winchester, Tennessee. Naftilan utilizes a Littmann TeleSteth System stethoscope, patient privacy-compliant video conferencing and a high definition camera. His patient is spared the three-and-a-half hour trip between the remote clinic and Vanderbilt University Medical Center (VUMC) and so is Naftilan. He’s so pleased with the pilot program that he sent letters to all his Winchester patients notifying them of the telemedicine service. 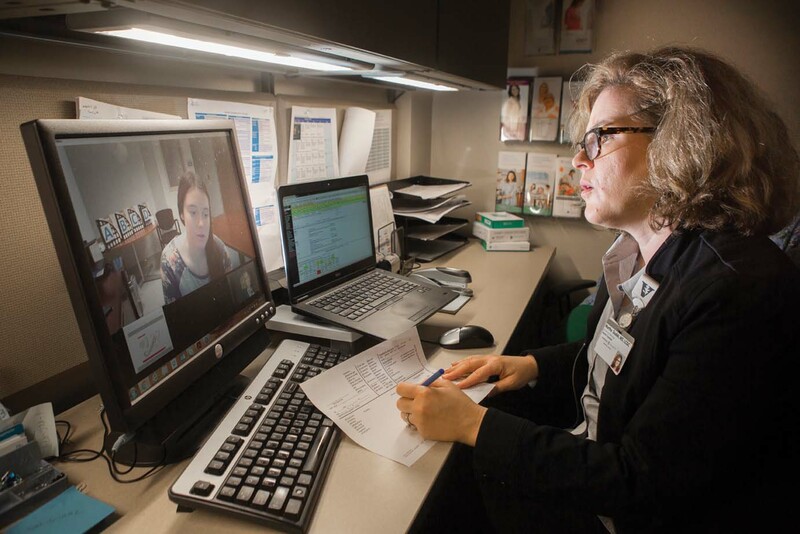 Telemedicine and telehealth are transforming the delivery of care at VUMC and beyond by bridging distances for better collaborations between partner providers and saving time so hospitals and physician clinics can operate more efficiently. In 2016, 8,745 VUMC consultations and visits used remote video communications technologies. Next fiscal year, VUMC is on track to surpass 14,000. “There is more momentum now than ever,” said Amber Humphrey, MBA, assistant director for Telemedicine. In total, 25 service lines at VUMC are participating in telemedicine initiatives. A dozen more are in various stages of development and implementation. From his office at VUMC, Kenneth Gaines, M.D., MBA, professor of Clinical Neurology, diagnoses a stroke in a patient at another hospital. Other VUMC clinicians use telemedicine to provide genetic counseling to aspiring mothers, answer prescription questions from hospital patients being discharged, and advise parents on strategies for raising children with autism spectrum disorders. Telemedicine, on the other hand, does integrate care. David Charles, M.D., professor and vice chair of Neurology and medical director of Telemedicine, said remote diagnostic technologies, ranging from examination cameras to specialized stethoscopes, give patients greater access to specialized physicians. Patients, who appreciate this convenience, are embracing this means of health care delivery. Sandra Hardin, 59, says telemedicine has improved her health and quality of life. She relies on a CardioMEMS device implanted into her pulmonary artery that can detect signs of worsening heart failure before symptoms, such as shortness of breath or weight gain, appear. 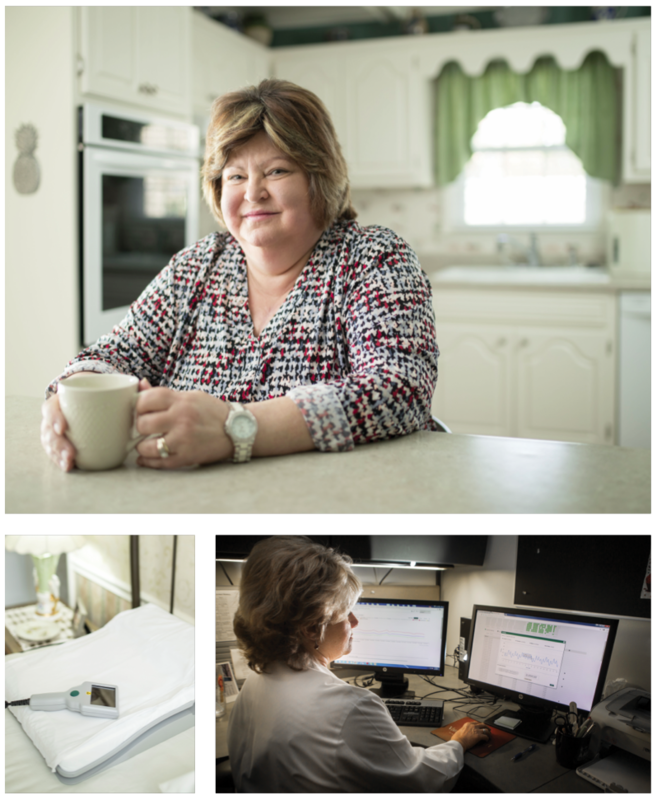 Every morning, she reclines on a special cushion at her home in rural Falkville, Alabama, that transmits a report to her cardiologist at VUMC. Patient Sandra Hardin, top, at home in Falkville, Alabama, uses the CardioMems pillow, bottom left, to transmit her pulmonary artery pressure to Connie Lewis, N.P., at Vanderbilt, bottom right. Telemedicine hasn’t had incentives and mandates to push its implementation, as was the case with electronic health records. Telemedicine has faced, and continues to face, legal, policy and reimbursement hurdles. In 2014 Tennessee became the 21st state to pass a telemedicine parity law, requiring insurance reimbursement for the service at the same level as in-office visits. However, Medicare won’t reimburse unless the telemedicine visits are provided in a health professional shortage area. The success of telemedicine will likely bring about more policy changes. State policies concerning medical licensure have continued to be refined, but much more work is needed. Most states require any physician practicing telemedicine to be licensed in the state where the patient is receiving care. While this is a common policy, it can present problems—especially when VUMC forges agreements with hospitals outside of Tennessee to provide specialty physician services. Liza Weavind, MBBCh, MMHC, professor of Anesthesiology and Surgery, has dealt with these issues setting up a teleICU hospital network that will stretch across state lines. The Federation of State Medical Boards is working to develop an interstate contract to expedite that process; only a few states have joined thus far. 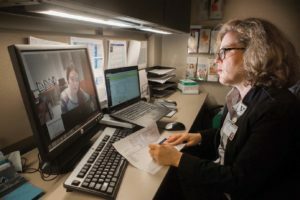 Hospital administrators are aware that they often don’t have the resources to provide highly specialized experts to manage complex patients and see teleICU as an opportunity to bring this skill set to the bedside virtually, she said. TeleICU is a teamwork initiative to improve patient outcomes. Quantifiable benefits of teleICU programs include reducing lengths of stay and improving outcomes for critically ill patients. Under this scenario, once culture results are available—no matter the time of day or night—antibiotics can be de-escalated and optimized by the intensivist on the TeleICU, she explained. Telemedicine can keep children in rural areas from falling through the cracks when they need specialized services not readily available in their hometowns. Vanderbilt Kennedy Center’s Treatment and Research Institute for Autism Spectrum Disorders (TRIAD) is using telemedicine to provide diagnostic assessments, early intervention services and school-based consultations. From July to November 2016, TRIAD conducted 176 telemedicine visits across the state when it partnered with the Tennessee Department of Education. A teleaudiology pilot program proved effective in identifying infants with hearing loss. A partnership between the Vanderbilt Bill Wilkerson Center and the Tennessee Department of Health, the program set out to retest the 29 percent of infants currently lost to follow-up who don’t pass their initial newborn hearing test. A remote clinic set up in Union County retested 31 babies from March 2013 to June 2015, reducing the percent of babies lost to follow-up. Weakley County experienced the most dramatic improvement from 40 percent lost to follow-up to 0 percent. Two of the 31 babies required more advanced diagnostic testing, said Alison Kemph Au.D. Plans are in the works to launch this initiative in some Vanderbilt Health Affiliated Network facilities with high-speed internet connectivity, Kemph said. With philanthropic support, telemedicine at Children’s Hospital will be expanded to serve even more children in rural communities. Aspiring parents who received remote genetic counseling have given it rave reviews. The pilot program, which started in April 2015 at the Vanderbilt Center for Women’s Health at NorthCrest Medical Center in Springfield, Tennessee, is being considered for Clarksville, Tennessee. 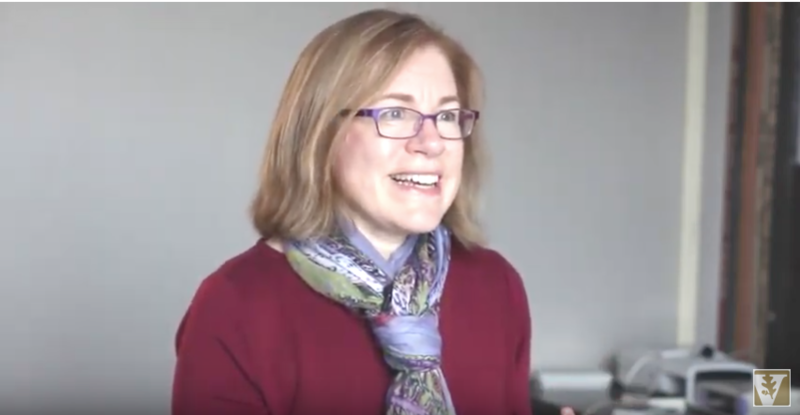 Genetic counseling via teleconferencing expands access and improves efficiency for both patients and physicians, says Martha Dudek, LCGC, senior associate in Obstetrics and Gynecology. Photo by Susan Urmy. Another pilot program utilizing telemedicine, Meds to Beds, was so successful that it is now the standard of care for the Vanderbilt Adult Hospital and plans are in the works to bring it to Vanderbilt Stallworth Rehabilitation Hospital. Patients being discharged from the hospital no longer have to go to a pharmacy for prescriptions. Instead, they receive their medications and counseling from the pharmacist via telemedicine before leaving their hospital rooms. Gaines supervises the team providing services to a teleneurology network that is staffed by 13 neurologists, serving nine community hospitals across Tennessee. The program is growing so rapidly that VUMC isn’t the only hub site providing the service, Gaines said. The goal is to facilitate hubs in other parts of the state in the same way that Johnson City Medical Center is a hub for two community hospitals in East Tennessee. Of 1,980 consultations VUMC neurologists conducted from 2014 – 2016, the vast majority of patients—87 percent—were successfully treated at their local hospital, according to a report recently presented at the American Neurological Association by Kelly Harper, Vanderbilt Telemedicine program coordinator II. Harper also reported that surveys of community-based physicians utilizing VUMC’s teleneurology service showed that 92 percent found the service to be satisfactory or excellent. VUMC also benefits from fewer stroke transfers. 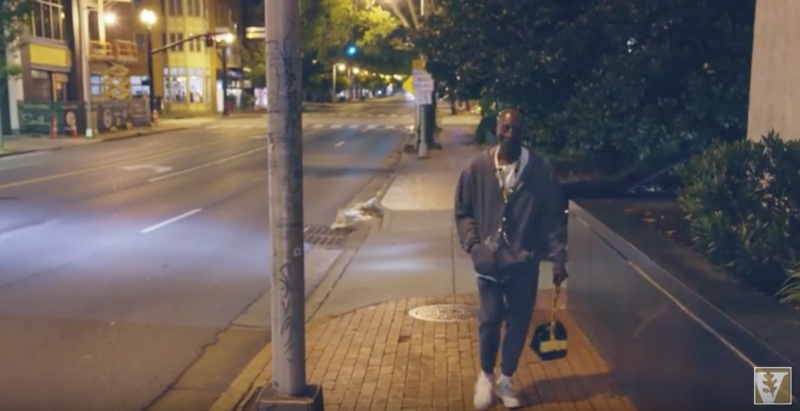 “Our teleneurology service helps ensure that our neuro-critical care unit has space for someone who must urgently transfer to Vanderbilt for an intervention or surgical procedure that is not available in the community-based hospital,” Charles said. Plans are in the works to set up a system with Vanderbilt Stallworth Rehabilitation Hospital so head trauma patients can be quickly monitored after they progress from critical care units to the recovery process. A telepsychiatry program is also in the works. 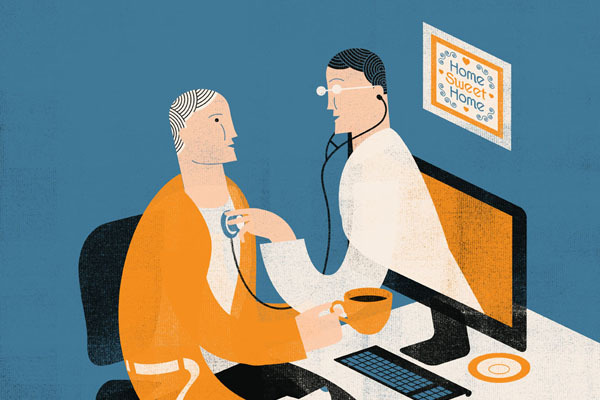 Community-based primary care providers can also benefit from telemedicine. “Would there be a way that providers in the Vanderbilt Health Affiliated Network could provide direct-to-patient urgent care for things like upper respiratory tract infections?” Charles asked. “That’s an area we are actively exploring.